Paladins gain a +2 class bonus to Strength or Charisma, as long as it isn’t the same ability you increase with your +2 racial bonus. Possible backgrounds include: city guardsman, combat medic, bodyguard, outlaw hunter, and inquisitor. 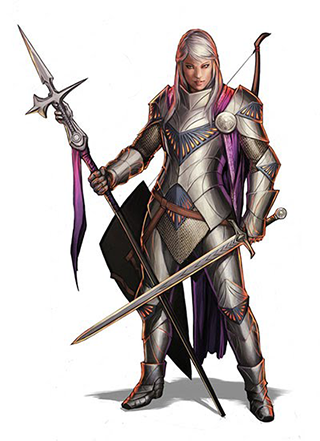 At 1st level, a paladin starts with a melee weapon or two, a ranged weapon if they want it, armor, a shield, and standard non-magical gear that is suggested by the character’s backgrounds. Paladins may start with either 25 gp or 1d6 x 10 gp. All paladins have the Smite Evil class feature. You can use this talent once per battle, plus an additional number of times per day equal to your Charisma modifier. As a free action before you make a paladin melee attack roll, you can declare that you’re using a Smite Evil attack. Add +1d12 to the damage roll AND deal half damage with the attack if it misses. Adventurer Feat Your Smite Evil attacks gain a +4 attack bonus. Champion Feat Add 2d12 to the damage roll instead of 1d12. Epic Feat Add 4d12 to the damage roll instead of 2d12. You get an additional paladin class talent at 5th level, and again at 8th level. In addition, once per battle when a nearby ally is hit by an attack, you can choose to lose hit points equal to half of that damage, and have your ally take only half of the damage instead. The damage you lose can come from temporary hit points, but isn’t affected by damage resistance and other tricks to avoid the damage. Adventurer Feat Increase your total number of recoveries by 1. Champion Feat Once per day, you can use Bastion twice in the same battle. Epic Feat When you use Bastion now, your ally takes no damage. You still lose hit points equal to half the damage. Adventurer Feat You can use your Charisma as the attack ability for cleric spells you can cast. Champion Feat You can now cast the cleric class feature heal spell twice per day. Epic Feat Choose two cleric spells instead of one. Special: You can choose Divine Domain a second time, if you wish, at 5th level or at 8th level. Choose one of the domains listed in the cleric’s class talent list. You gain all the domain’s advantages, including the ability to use the domain’s invocation once per day. If the domain you choose is designed to help cleric spells and attacks, reinterpret the talent to help your paladin powers. You can use the domain’s feats if you wish; reinterpret them similarly if necessary. You are immune to fear abilities and to any non-damage effects of attacks named or described as fear attacks. In addition, you gain a +1 melee attack bonus against enemies that are not engaged by any of your allies. The bonus increases to +2 against enemies with fear abilities. Adventurer Feat You gain a +1 bonus to death saves. Champion Feat You gain a +1 bonus to all saves except death saves. Epic Feat Your nearby allies gain a +1 bonus to death saves. You can roll saves at the start of your turn instead of at the end of your turn. A successful save against ongoing damage, for example, means that you will not take the ongoing damage that turn. Adventurer Feat You gain a +1 bonus to saves. Champion Feat Once during your turn as a free action, you can choose to lose hit points equal to your level to reroll a save. Epic Feat You gain a +1 bonus to Physical Defense and Mental Defense. Twice per day as a quick action, you can heal yourself or an ally next to you with a touch. You spend the recovery while the recipient heals as if they had spent the recovery. Adventurer Feat Add twice your Charisma modifier to the healing provided by Lay on Hands. Champion Feat Lay on Hands healing uses a free recovery instead of one of your own. Epic Feat You can now use Lay on Hands four times per day instead of two. When you hit an enemy with a melee attack, you can choose to challenge that enemy as a free action. Until the end of the battle, provided that both you and the enemy you’ve challenged are conscious and capable of making an attack, you each take a –4 attack penalty against all other creatures and a –4 penalty to disengage checks from each other. The attack penalty temporarily deactivates for the attacker when they make an attack roll against their rival, but only until the end of the attacker’s turn. For example, if a creature with more than one attack attacks you first, its subsequent attacks against your allies are without the challenge penalty. However, the attack penalty resets at the end of its turn, so it does not help with opportunity attacks against your allies later in the round. You can only have one enemy challenged at a time. you or the creature you are challenging falls unconscious or drops to 0 hp. you hit a different enemy with an attack (assuming you hit with the –4 penalty). the creature flees far away and you choose to end the challenge. An enemy can only be the subject of one Paladin’s Challenge at a time; a new challenge overrides the previous one. In the unlikely case in which two paladins fight each other, any use of Paladin’s Challenge locks them into a challenge that only ends when one of them drops. Adventurer Feat The attack and disengage penalty for challenged enemies (but not for you) is equal to –4 or to the escalation die, whichever is higher. Champion Feat You can have two challenges active at the same time against different enemies. Epic Feat Enemies you challenge are vulnerable to your attacks. Special: You can’t take this talent if you take the Way of Evil Bastards talent. Your nearby allies gain a +1 bonus to all saves. Adventurer Feat Once per day, you can reroll your relationship dice with a heroic or ambiguous icon. Champion Feat All of your melee and ranged attacks deal holy damage. Epic Feat You gain an additional relationship point with a heroic or ambiguous icon. Special: You can’t take this talent if you take the Path of Universal Righteous Endeavor talent. When one of your Smite Evil attacks drops a non-mook enemy to 0 hp, that use of Smite Evil is not expended. Adventurer Feat Once per day, you can reroll your relationship dice with a villainous or ambiguous icon. Champion Feat When one of your Smite Evil attacks drops three or more mooks, it is not expended. Epic Feat You gain an additional relationship point with a villainous or ambiguous icon.